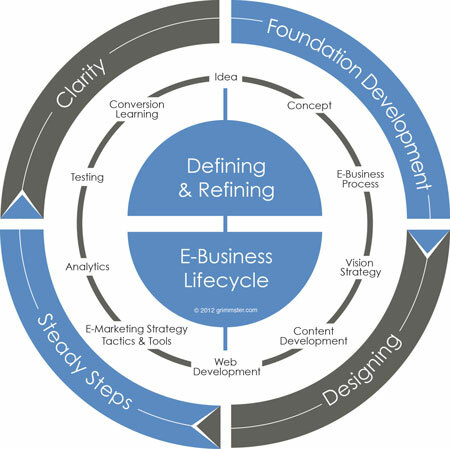 The eBusiness Lifecycle is a part of a process developed and used by Grimmster. The lifecycle was created over several years of developing and testing ebusiness start-ups. The purpose of the lifecycle project was to more clearly communicate to clients the ever changing internet marketing environment. It serves as a foundation for building a methodology and designing better and more accurate outcomes for ebusiness innovations and startups. – In simple terms we are working at answering the question most people want to know …How do a build a system of more accurately finding, qualifying and converting new business online. We have built other models as part of this process that are continually sculpted and refined. As a result we have developed a methodology of a “steady growth process” where start-up ideas and innovation is an ongoing process by business. Defining, evaluating and refining the process of innovation builds for better outcomes and solid businesses that are built to last the long term. Share your comments or feedback via email or twitter. Contact us if you would like a larger version in PDF. If you would like to build on this process we would love to speak with you. eBusiness LifeCycle by Charles Grimm is licensed under a Creative Commons Attribution-NonCommercial-NoDerivs 3.0 Unported License.